Size of this preview: 800 × 404 pixels. Other resolutions: 320 × 162 pixels | 817 × 413 pixels. 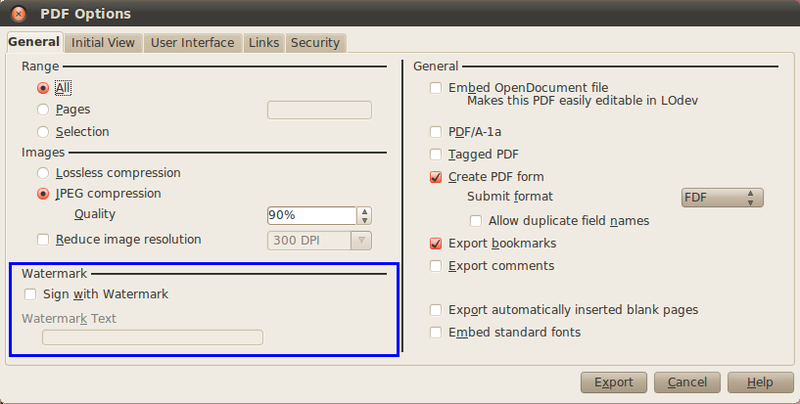 PDF Export dialog now comes with Watermark option. 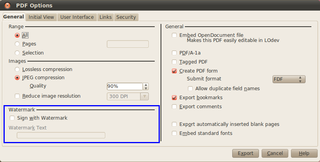 It will be available in LibreOffice 3.6.
current 2012-05-09T06:43:45 817 × 413 (54 KB) Korrawit (talk | contribs) PDF Export dialog now comes with Watermark option. It will be available in LibreOffice 3.6. This page was last edited 06:43:45, 2012-05-09 by Korrawit Pruegsanusak.